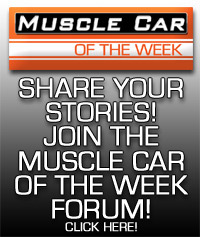 This week, we're featuring a 1970 Plymouth 'Cuda AAR, a high-revving 340 V8 powered Trans Am car for the street! These had all kinds of speed and performance parts, and the high impact visuals to go with them. This particular car is one of only 5 FT6 Burnt Tan versions built, with only 2 known survivors. This week, we have a special car for Mopar fans from the Brothers Collection. This is the very first 1969 Plymouth Road Runner A12 446 Pack ever built! This was the pilot car used by Chrysler to promote the A 12 Roadrunner package, and it has been called the "Wayward Beeper". Its significant history is bolstered by an appearance in Super Stock Magazine, where it was tested and tuned by legendary speed-shifter Ronnie Sox. This car features the 390 hp 440 V8 with 3 2 barrel carburetors, and A833 four-speed transmission, 4.10:1 rear gears, and a stripped-down interior. This very car has gone 12.91 seconds in the quarter mile, leading Chrysler to call it the fastest A12 ever built! This week, we're featuring a 1970 Dodge Challenger R/T 426 HEMI as our pick for Muscle Car Of The Week from the Brothers Collection. There were only 157 of these cars built, and this Plum Crazy Purple version has all the right parts to make it one of the most prized Mopars in the collection. Starting with a 425 HP 426 HEMI V8, Pistol Grip 4-speed, dual 4 barrel carbs and more, it's a run and gun racer for the street! This week's Muscle Car Of The Week from The Brothers Collection is a super-rare 1970 1/2 Pontiac Trans Am, complete with the Ram Air IV 400 cube V8 and Muncie 4-speed transmission! 1970 marked the second generation for GM's F body platform, and the company made substantial improvements to the car over the '67-'69 versions. The 1970 1/2 models were longer and more spacious inside, and generally drove more comfortably than the earlier cars. 1970 also marked the peak in performance Muscle Cars, and the 1970 1/2 Trans Am was one of the top performers. The Pontiac Trans Am came loaded with numerous performance add-ons, such as upgraded suspension, brakes, exhaust, and distinctive styling. This particular Polar White Trans Am is among the most sought-after of all, as it features the 370 HP Ram Air IV V8 engine and a Muncie 4-speed transmission. The Ram Air IV engine was assembled with very tight tolerances from the factory, making it as close to a hand-built racing engine as you could buy from GM. The RAIV package started with a 4-bolt main block, forged crank and pistons, and a high performance oil pump, but the big difference was in the top half of the engine. The Ram Air IV heads boasted 67cc chambers, 2.11" swirl-polished intake valves and 1.77" exhaust valves, and large round exhaust ports. The .520" lift RAIV cam had a long 308 degree intake / 320 degree exhaust duration and pulled air through an aluminum dual-plane intake manifold. These parts sounded more like they were hand-picked by a race engine builder than a factory offering, but that's what makes the RAIV so special. They only made 88 of these cars, 59 were manuals and the other 29 came with automatics. It's one of the few cars where both transmissions were offered and the manual outsold the auto. Watch the video to learn more about this Pontiac Historical Society documented correct '70 1/2 and its unique details like the original 2-tone blue seat covers, 1-year only Rally II wheels, and distinctive styling elements. The Pontiac GTO is credited as one of the cars to launch the Muscle Car genre, and this '65 Tiger Gold GTO convertible from the Brothers Collection is a great example of why these GTOs are so cool. Powered by a 335 HP 389 cube V8, this GTO has the "Go", and the rare Tiger Gold color gives it plenty of "Show!" 1979 marked the 10th anniversary of the Pontiac Trans Am. In this episode, we spotlight a 1979 10th Anniversary Trans Am from the Brothers Collection that shows a mere 111 miles on the odometer! This one features the Pontiac 400 V8 and four-speed transmission, and is the very same car owned by Pontiac advertising executive Jim Wangers and featured in the movie "Joe Dirt". Although some consider this car to be overdone with its five color hood bird, two-tone paint, & silver interior, we really like the styling of this 1 of 1817 made Anniversary edition.